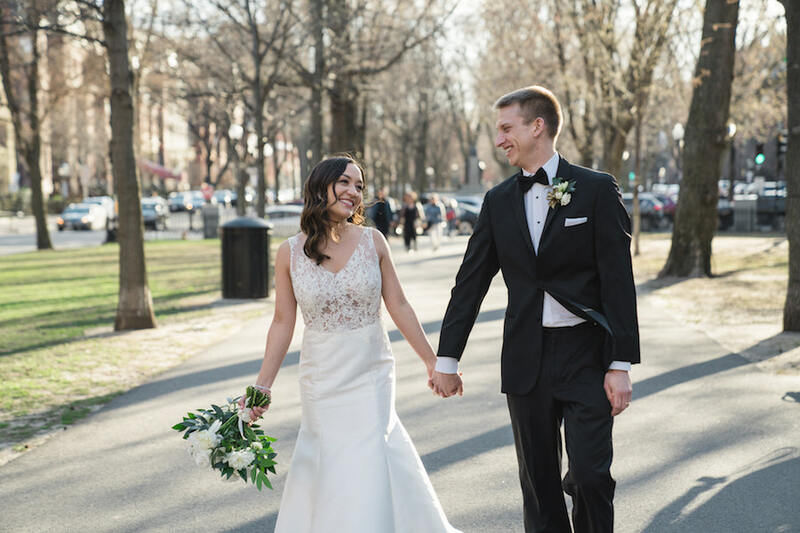 By Rachel Kashdan·	 2/1/2019, 3:16 p.m.
Lauren Kim and Jordan Martin met not in college, at the office, or on Tinder, but in eighth grade when Jordan moved to the town of Westborough, where Lauren lived. Their courtship began two years later during their sophomore year, when they had health and math class together and hit it off. “It all started there, and we’ve pretty much been dating since,” Lauren says. 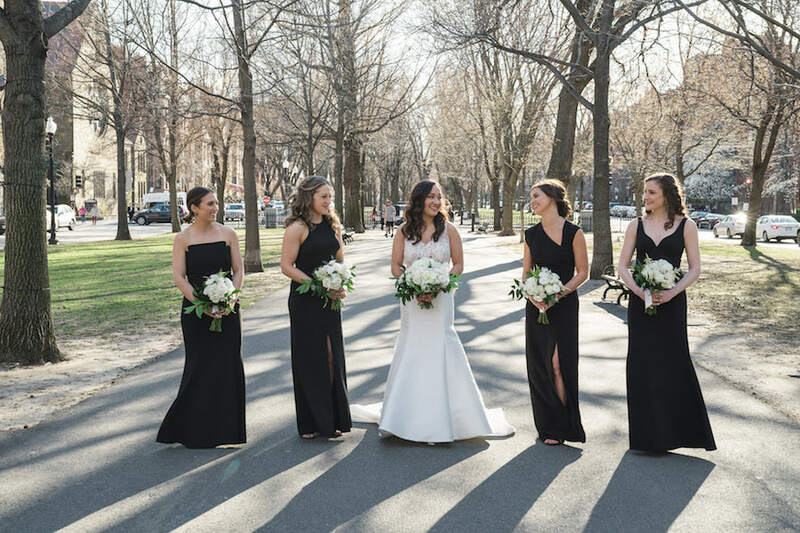 After their high school graduation came seven years of dating long distance, first while he attended the University of Connecticut and she was at Boston University, and then after graduation as they hopped around Massachusetts, Connecticut, and New York City for various job opportunities. “It sounds crazy but it was so easy, and we were so happy, so it never felt like a chore to be long distance,” Lauren says. 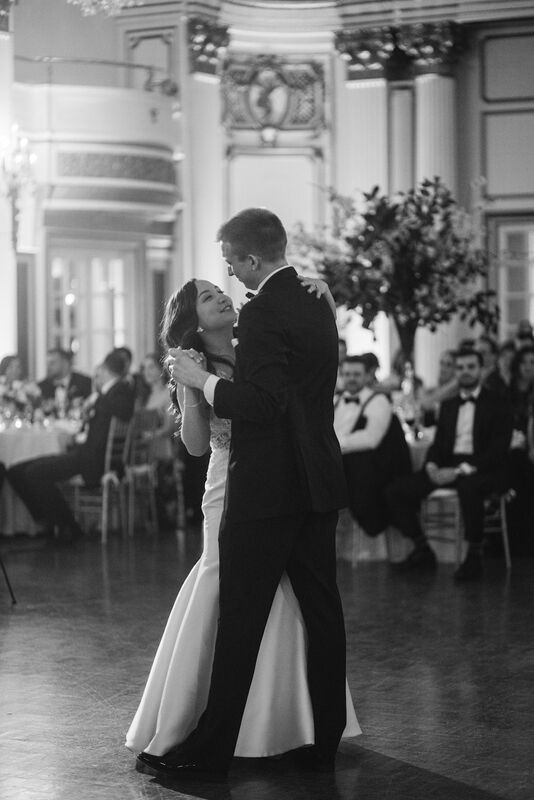 “We knew for a while that this was who each of us wanted to be with.” Finally, in 2013, Lauren moved back to Boston, where Jordan had just gotten a job. They moved in together in 2015, never to be apart again. Lauren had hoped they’d get engaged shortly after moving in together, but it would be about a year before Jordan popped the question. “Jordan’s kind of a procrastinator,” Lauren says, with a laugh. One October evening, Lauren was watching TV in their Back Bay apartment when Jordan walked in the door, coming home late from work. “He’s like, ‘I’m starving. Want to come to the convenience store and pick up some snacks?” Lauren says. “He usually just goes on his own, so my ears perked up. I was like, ‘Hm, maybe this is him wanting to take me on a walk to get engaged.’” They stopped at the store to buy snacks and then Jordan suggested they head to the Esplanade. They sat by the river enjoying the quiet and then, as Lauren predicted, Jordan popped the question. “It was very low key, just the two of us,” Lauren recalls. 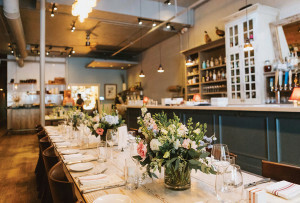 When it came time to plan their wedding, the couple had two priorities in mind: a church ceremony and a distinctly “Boston” celebration to follow it. “We live right downtown and we spend a lot of time there, so we really wanted that city feeling,” Lauren says. 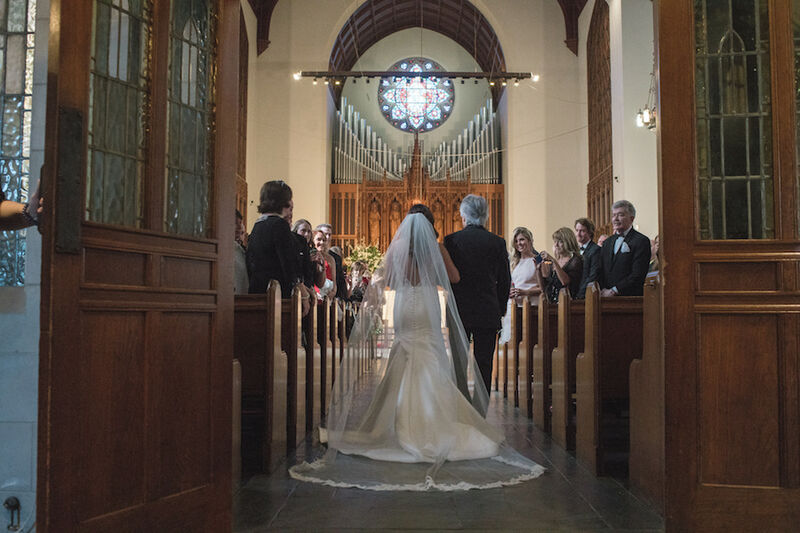 “We wanted our friends and family to get a taste of our neighborhood and where we live.” That vision came to life with a ceremony at Boston University’s Marsh Chapel, followed by a party with 210 guests at the Fairmont Copley Plaza, where the couple often go on date nights at Oak Long Bar + Kitchen. 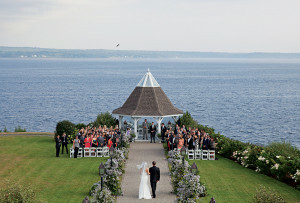 “[The Fairmont] was the perfect blend of tradition and regalness that I was looking for,” Lauren says. 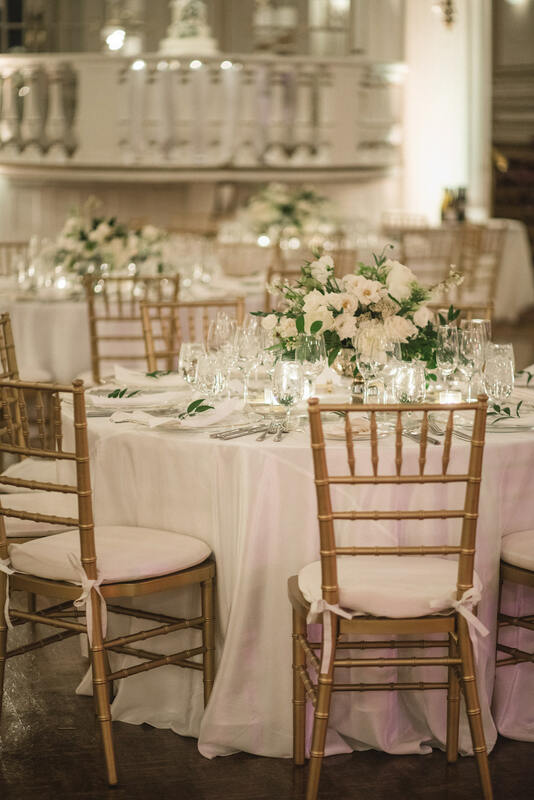 To balance out the stately feel of their venue, Lauren and Jordan accented the space with modern touches such as simple place settings and all-white floral arrangements. “I didn’t want things to feel overdone or stuffy,” she says. 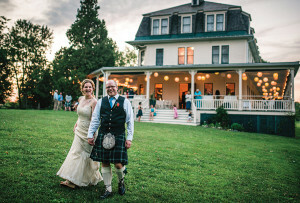 And “stuffy” it wasn’t: “Both of our families are big partiers and dancers,” the bride says. “The night started out fun and tame, but we had an open bar and I have some crazy cousins, so it was amazing,” Lauren says, with a laugh. 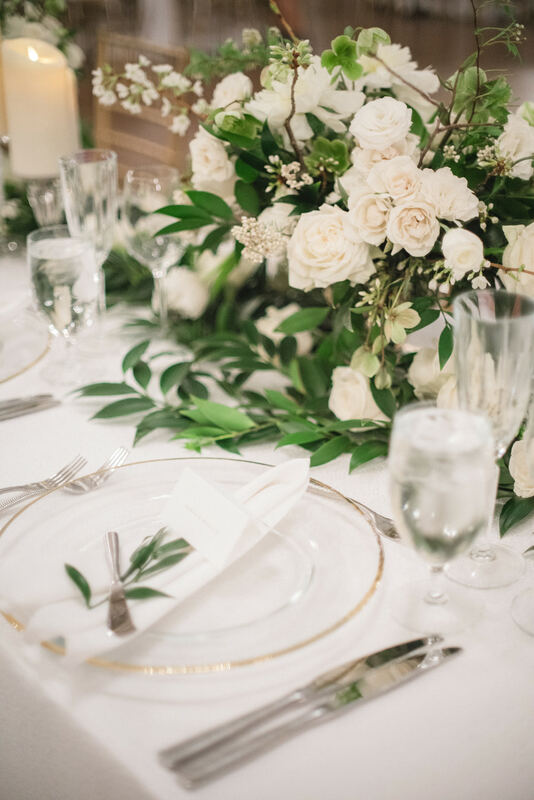 For their place settings, the couple opted to keep things simple with translucent, gold-rimmed charger plates topped with a sprig of nagi. 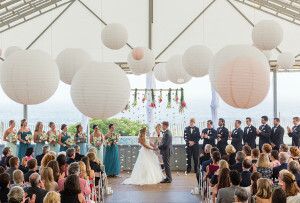 “The room was so beautiful and ornate that I didn’t want to compete with that,” Lauren explains. 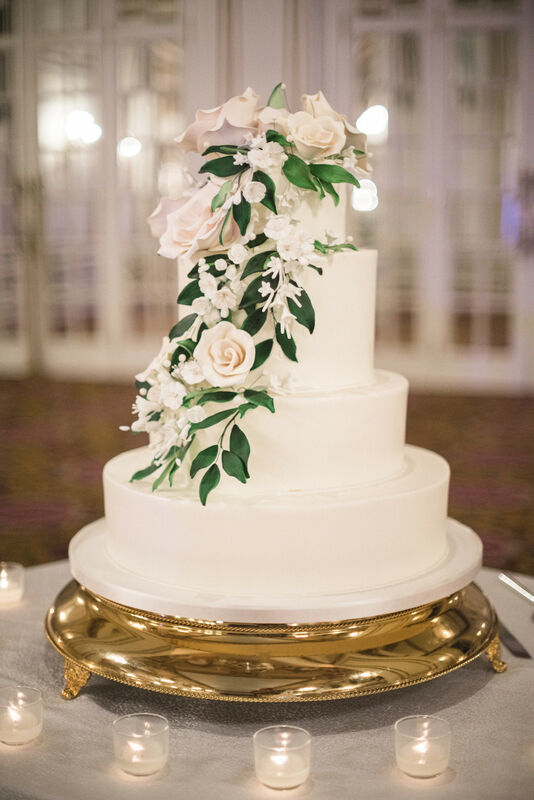 The marble wedding cake featured cascading sugar flowers that echoed the arrangements of peonies, garden roses, hellebores, lisianthus, and greenery that filled the ballroom. “Everyone thought the flowers on the cake were real,” Lauren says.